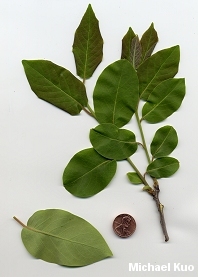 Small tree with distinctive bark broken up into square-shaped blocks; leaves shaped like candle flames, 3-6 inches long; fruit a large, orange to purplish berry. Habitat: Found in southeastern North America in various ecosystems (especially southern hardwood, southern pine-oak, and oak-hickory forests). Stature: Up to 50 feet high; trunk to about 1 foot in diameter; when mature featuring a broad, rounded crown. Leaves: 3-6 inches long; simple; alternate; shaped like candle flames; edges even; dark green above; paler green below. 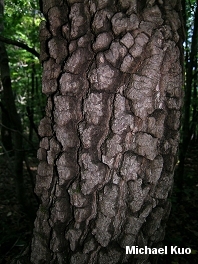 Bark: Thick; broken into distinctive, square-shaped blocks; dark grayish brown to nearly black. 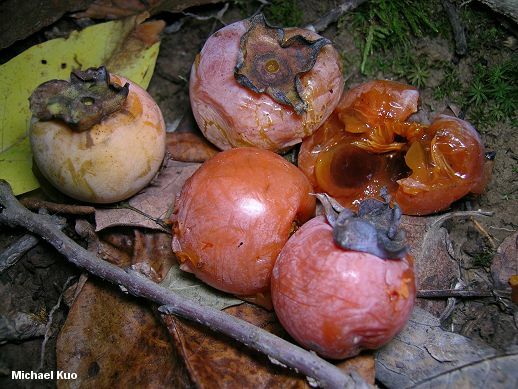 Fruit: A large, round berry 1-2 inches across; greenish becoming orange, often with a purplish cast.